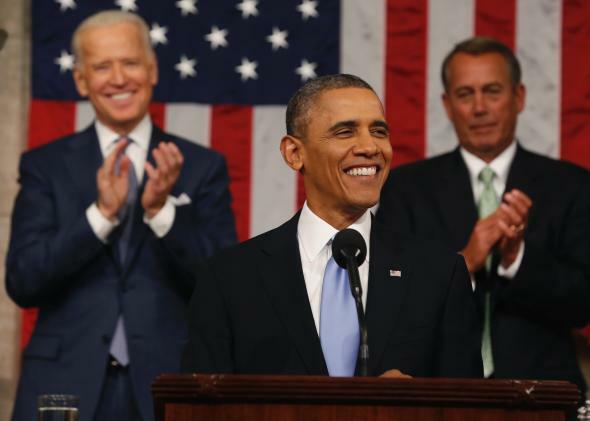 State of the Union: Why Obama barely mentioned K-12 education in his speech. President Obama finishes the State of the Union speech without having said much about K-12 education. With ambitious child care and community college proposals, President Obama had plenty to say about education for our youngest and older students in last night’s State of the Union address. But he barely mentioned K-12 education. Perhaps that’s because after devoting a significant amount of political energy to pushing for K-12 education reform during his first term in office—using Race to the Top funding to stimulate state reforms and overseeing the state-by-state rollout of Common Core—the Obama administration has pretty much stopped introducing new policy ideas. There are several reasons why Obama might be backing off K-12 reforms. Since he introduced his major initiatives—which stress accountability, testing, and school choice—the education policy landscape has become increasingly ugly: There is strong opposition to Common Core, particularly from Tea Party conservatives. Some Republicans, in opposition to Obama, have veered further to the right on education, pushing publicly funded tuition vouchers at private schools. And a growing number of parents and teachers—many of them on the left—have stepped up to criticize the number of standardized tests students take each year. Despite being seen as a federal program, Common Core is actually a set of standards voted in on a state-by-state basis, meaning the Obama administration doesn’t actually have a ton of control over it beyond funding state initiatives through the Department of Education. So it makes sense that Obama wouldn’t bring it up Tuesday night. And earlier proposals, like a national rollout of universal pre-K, a pledge from Obama’s 2013 State of the Union, weren’t able to gain traction even when Democrats controlled the Senate. Late last year the federal government encouraged states to renew waivers that get them around the Bush-era policy No Child Left Behind in exchange for adopting policies supported by the Obama administration. Forty-three states and D.C. all currently have waivers, meaning that they are implementing K-12 initiatives that Obama supports. New waivers would carry those states into the 2018–19 school year, well into the presidency of Obama’s successor. Maybe the president didn’t say much about K-12 education last night because that says enough.